Today while munching on a veggie and goat cheese Panini, I participated in a lunchtime webinar offered by the American Management Association (AMA). This is not something I normally do but the title of today’s session was The Inescapable Conundrums of Managing. How could I pass that up? In it, Ed Reilly, AMA’s CEO, interviewed Henry Mintzberg, renowned Professor at McGill University in Montreal, about his new book Managing. 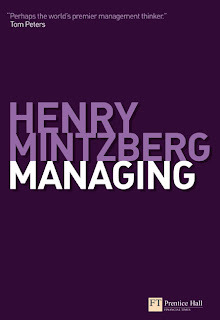 Professor Mintzberg has been researching and writing books on management since the 1970s. In discussing his latest one, he made some interesting points about leadership and management. His main points were that there has been too much emphasis on leadership and that it is time to get back to management. In discussing the relationship between the two, he said, “a manager who can’t lead is discouraging, but a leader who can’t manage doesn’t know what’s going on.” He described a problem he called macro-leadership which seems to be the polar opposite of micro-managing. People who are macro-leading are too removed from how things are done. They need to get on the ground to help people grow and get results. He felt that this was more important in getting businesses through tough times than leadership. Among other things, he discussed how to develop managers. He said, “You can’t create managers in a classroom.” By this he meant, that you can develop some skills such as coaching or negotiating in the classroom, but that it takes more than that to become a good manager. Instead of traditional management training programs he felt we need to recognize that successful managers learn from experience, so we should build learning around managerial experiences. He described a learning approach where you have managers work on a business problem in small groups, you supply some conceptual information, but the solution to the problem will be worked out by using the collective experience of the managers in the group. They solve the problem and in the process, they learn and grow. You can learn more about this approach at CoachingOurselves.com.